A car was submerged in about six to eight feet of water after it slipped down a boat ramp in Mission Valley. 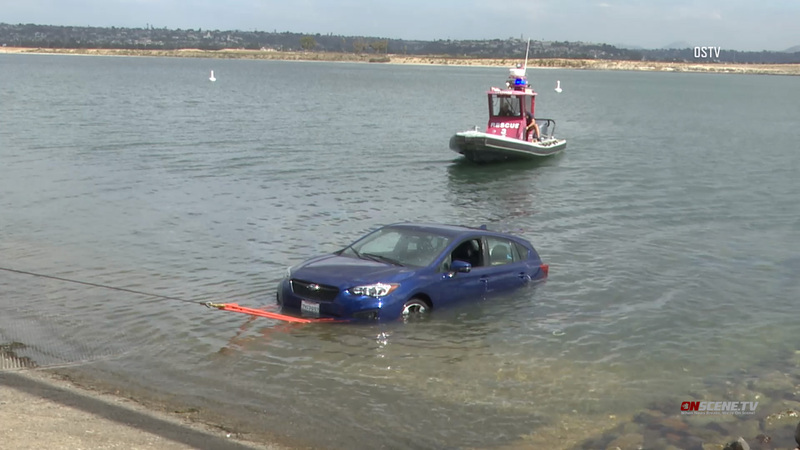 A car got submerged in the water Wednesday after the driver and his passenger tried to pose for a photo at the water’s edge of a boat ramp in Mission Bay, police said. The incident happened around 12:20 p.m. Manuel Silla was in the parking lot when he saw the blue Subaru started to slip into the water and called 911. The two men were uninjured and were able to swim out of the car and into shore, San Diego police Sgt. Cory Mapston said. It took a two-man lifeguard team to help tow the car out of the water. It was submerged in about six to eight feet of water. It doesn’t appear that alcohol or drug was involved in the incident, Mapston said.